This column was written by Jim Talent. In an editorial on Sunday, May 10, the New York Times took the Obama administration to task for not cutting defense spending more deeply. Now, one wonders whether the Times is serious, or whether it is sending some kind of intramural signal intelligible only within the political Left. The administration is already making deep cuts in the defense budget and will undoubtedly cut even more in the future, despite the need for substantial increases in the modernization budget, which the Heritage Foundation, among others, has documented and about which I have written previously for National Review Online. Yet the Times editorial is worth some consideration, because it is so typical of what passes on the Left for "analysis" of defense spending. The editorial does not actually discuss the programs it wants to cut, much less the general condition of America's military or the risks America currently faces. Rather, its recommendations spring from a deeply ideological aversion to military power that is increasingly out of date and dangerous in the post-Cold War world. First, the Times mischaracterizes the programs it criticizes. For example, it calls the F-22 air-superiority fighter "redundant." Whatever else can be said about the F-22, it is not redundant. It's the only fighter in the Air Force that can match the modern aircraft America's competitors are acquiring in increasing quantities. Certainly the Russians and the Chinese will not shut down their Sukhoi and other advanced-fighter lines on the grounds that they are "redundant." Numbers matter; without adequate numbers of 21st-century fighters, the United States cannot achieve air superiority, and without air superiority, military operations in places like the Straits of Taiwan become impossible. Similarly, the Times calls the Virginia-class submarine program "wholly unnecessary" and wants to eliminate it. Yet the Virginia class is the only active submarine line the United States currently operates, which means that, were the line to close, the United States would eventually have no submarine fleet. Without submarines, the Navy cannot protect its aircraft carriers or control sea lanes, and we would lose a valuable intelligence-gathering asset. Have submarines suddenly become "wholly unnecessary"? The Chinese don't think so. They have constructed a huge new submarine base and are building four or five new advanced submarines every year. Even if the United States continues acquiring the Virginia-class boats at the current rate, the Chinese submarine fleet will surpass ours by the middle of the next decade. Second, the Times simply ignores the threat environment in which the military must operate and the United States must protect itself. Every category of risk that America faces is undeniably growing. China has been acquiring Russian-built carrier-killer missiles for years and is now developing its own long-range variants. Russia invaded Georgia last August, Iran gets closer to a nuclear military capability every day, North Korea is developing a longer-range missile, the terrorists are fighting for control of nuclear Pakistan, the bipartisan Commission on Weapons of Mass Destruction unanimously found last December that the terrorists would have a nuclear or biological weapon within five years, northern Mexico is coming close to anarchy because of drug cartels, and piracy has become a major concern. The Pentagon doesn't determine its requirements by pulling weapons systems out of a hat. It develops force-structure and modernization requirements by analyzing the capabilities it must possess to deal with the threats America faces. Even the Obama administration concedes that the threats are real and that it has not conducted a thorough review of the international situation or the national military strategy. How can the Times - without even discussing the demonstrably growing risks, much less the capabilities necessary to meet them - now claim that programs the last three administrations have insisted were vital to American security have suddenly become "redundant" or "unnecessary"? The Times says that it wants to cut defense more deeply to deal with the growing deficit. But the Times never evidenced concern about frugality when the administration was calling for and Congress was passing the "stimulus" package and other measures that guarantee a doubling of the national debt over the next ten years. If the purpose of that spending was to stimulate the economy, why should the government now cut the defense budget? How can it be right to double the size of the Department of Energy, supposedly in order to create jobs, but wrong to build the ships and planes that America needs to protects its security and that really do support hundreds of thousands of high-paying American jobs? The Times doesn't answer these questions or even treat them as relevant. That is because the Times has allowed its ideology to distort its perception of global risk. President Obama and his allies are fond of referring to the need to end Cold War strategies and programs. For his own sake, the president should consider whether it is the opposition or the movement he leads that is trapped in the assumptions of the Cold War. Ever since Vietnam, the Left has distrusted American military power. That attitude was never valid, but in today's world - a world of rapidly developing and potentially aggressive peer competitors, rogue regimes with nuclear weapons, and well organized, ruthless terrorist groups - it is positively dissociated from reality. No one is arguing that America should view the world only - or even primarily - through a military lens. I have urged, as have many others, the importance of what Bob Gates calls the tools of "soft" power: public diplomacy, effective communication of American ideals and intentions, assistance in building the institutions of democracy and free markets that are a bulwark against radicalism. However, experience has shown that those tools can work only in an atmosphere of security, where the world is confident that the United States, as the animating force in a free-world consensus, can swiftly and effectively defeat any violent threat to freedom and democracy. For this reason, the Left's own goals require a strong American military with robust technological superiority. Otherwise, the president's faith in conciliation and international agreements is sure to be seen as weakness - a danger that is already evident after his recent meetings with world leaders. The irony of the Times editorial is that it advocates a position that, if adopted, would seriously undermine the foreign policy of the administration the newspaper wanted so desperately to elect. Mr. Obama campaigned on a platform of changing America. But on defense policy, it is he and his followers who will have to change, if America is to successfully negotiate the challenges of the 21st century - challenges that are now Mr. Obama's responsibility, and for the management of which he will be held accountable. Jim Talent is a distinguished fellow at the Heritage Foundation. 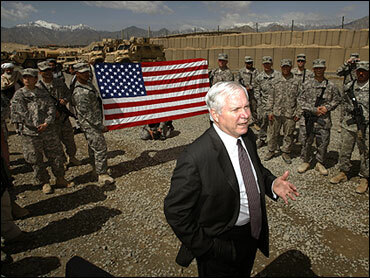 He has served in the U.S. House of Representatives (1993-2001) and the U.S. Senate (2002-07). He was a member of the Senate Armed Services Committee and, for four years, chairman of the committee's Seapower Subcommittee.